Description: Carpobrotus glaucescens is a prostrate, creeping succulent that has long trailing stems to 2 m long, which root at nodes along the stems. From these nodes the plant produces upright leafy branches. It has thick, fleshy, smooth leaves 3.5-10 cm x 1-1.5 cm, which are triangular in cross section. The plant grows to form a groundcover that can cover a large area. 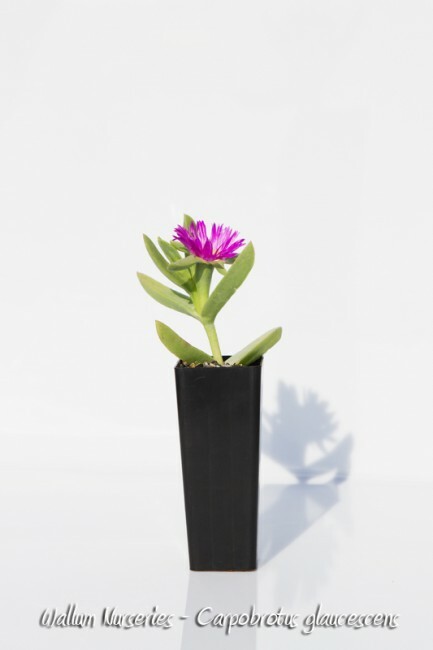 The plant produces large, striking, deep pink-purple daisy-like flowers from October to January, but also can flower sporadically throughout the year. The plant produces a red-purple berry fruit, which was used by the native aborigines as a food source. The flesh of the fruit is said to have a taste similar to salty apples. The roasted leaves have been used as a salt substitute. Early European explorers used the plant as an anti-scurvy treatment. Uses: Ideal for controlling wind erosion and binding sandy soils. Suitable for all coastal and low maintenance gardens, also good for rockeries.